(February 2014) An estimated 100 million to 140 million girls and women worldwide have undergone female genital mutilation/cutting (FGM/C) and more than 3 million girls are at risk for cutting each year on the African continent alone. 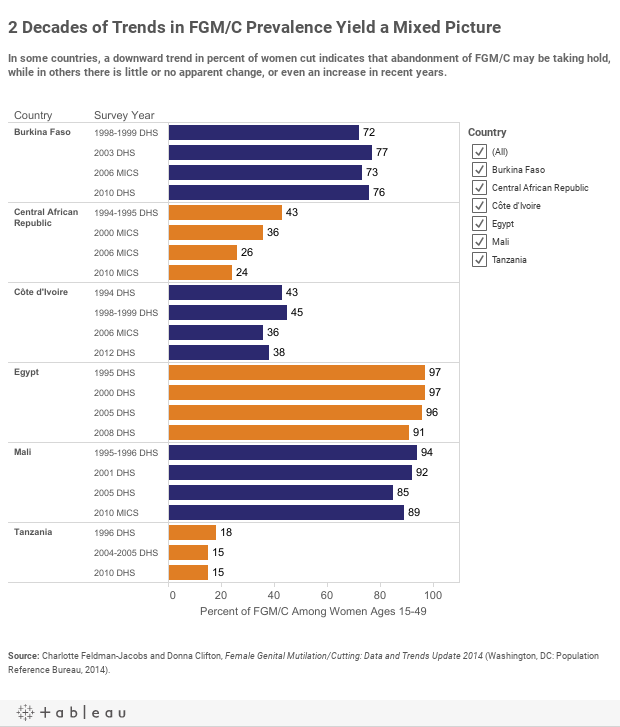 The PRB data sheet, Female Genital Mutilation/Cutting: Data and Trends Update 2014, contains the latest information available on the practice. This update of PRB’s 2010 wallchart shows the practice is still present in at least 29 developing countries, although there is some evidence that younger generations in some countries may face a slightly smaller risk. FGM/C is generally performed on girls between ages 4 and 12, although it is practiced in some cultures as early as a few days after birth or as late as just prior to marriage. Typically, traditional excisors have carried out the procedure, but in some countries the procedure has been performed by medical professionals. FGM/C poses serious physical and mental health risks for women and young girls, especially for those who have undergone extreme forms of the procedure. According to a 2006 World Health organization study, FGM/C can be linked to increased complications in childbirth and even maternal deaths. Other side effects include severe pain, hemorrhage, tetanus, infection, infertility, cysts and abscesses, urinary incontinence, and psychological and sexual problems. FGM/C is practiced in at least 28 countries in Africa and a few others in Asia and the Middle East. The 29 developing countries included on this chart are the only ones where recent data have been systematically collected. FGM/C is practiced in households at all educational levels and all social classes and occurs among many religious groups (Muslims, Christians, and animists), although no religion mandates it. Prevalence rates vary significantly from country to country (from nearly 98 percent in Somalia to less than 2 percent in Uganda and Cameroon) and even within countries. Since the early 1990s, FGM/C has gained recognition as a health and human rights issue among African governments, the international community, women’s organizations, and professional associations. Global and national efforts to end FGM/C have resulted increasingly in legislation targeting excisors, medical professionals, and families who perpetuate the practice; of the 29 countries on this wallchart, 25 now have laws or decrees related to FGM/C. Read a PRB blog about Feb. 6, the International Day of Zero Tolerance for FGM/C. In a number of countries, data collected in recent years reflect lower levels of cutting among girls ages 15 to 19, giving hope that abandonment efforts are yielding results. Charlotte Feldman-Jacobs is program director, Gender, at the Population Reference Bureau. Donna Clifton is a communications specialist in International Programs at PRB.